One of the benefits to gardening in Arizona is that there is literally a 12 month growing season. Some people would claim 10, because they don’t want to garden during July and August when production drops off and it’s just too stinkin’ hot to be out there doing anything. They do have a point. I’m down to just two watermelons, although one is PERFECT! The zucchini and squash have slowed to a few fruit a week, the tomatoes have stopped having ANY blossoms, and the only thing really growing any new stuff are the peppers and tomatillos… and maybe sweet potatoes, but I can’t actually see those. 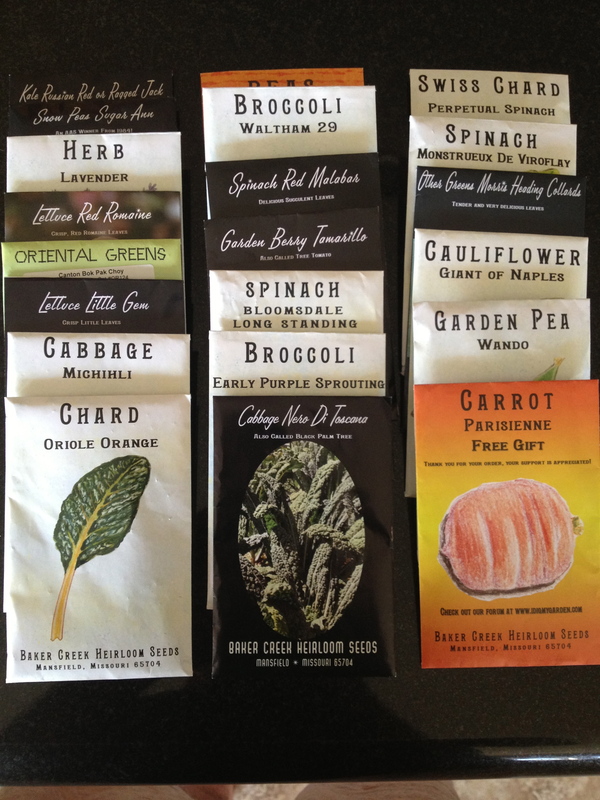 But having said that, I got my seeds this week for the fall/winter garden! I’ve been reading about everybody’s fresh salads, chards, broccoli, greens… and I just keep thinking… SOON! My only real challenge for the fall/winter is light. My backyard faces north and my homeowners association faces south… I mean, my front yard faces south, so I really can’t grow anything out there (well, I might sneak a couple of landscape looking plants out there, but they won’t be on the official “approved” list). During December and January the only part of my yard that actually gets light is the very last few feet next to my block wall. So I have plans to build a couple of terraced planters in the back that will greatly increase my growing space, along with a couple of raised beds that will get light from September – November. I’ve found that the veggies not getting enough light just kind of “pause” until they start to get it again. Here’s the seed I got from Baker Creek. I love the fact that they throw in a ‘freebie’. In the spring it was flowers, this time it’s carrots. It’s a nice touch. Two of the items are really for spring, the tamarillos and the malabar spinach, although I’m thinking I’m going to throw a few malabar spinach seeds in the spot recently vacated by corn. This entry was posted in Arizona Garden, desert garden, malabar spinach, Starting Seeds, tamarillo and tagged Arizona, Baker Creek, Seed, Sweet potato, Tomatillo. Bookmark the permalink. Arizona Garden, desert garden, malabar spinach, Starting Seeds, tamarillo, Arizona, Baker Creek, Seed, Sweet potato, Tomatillo. There should have been a warning at the beginning because I almost had a heart attack reading fall and winter gardening since I haven’t had my first tomato yet. 🙂 Hope you have good luck with your fall garden. Well, we have to start tomatoes in December and then plant out in the garden in late March. The tomatoes have been getting smaller and less frequent with the heat. I was just mentioning to my wife that my tomato plants are “done”.